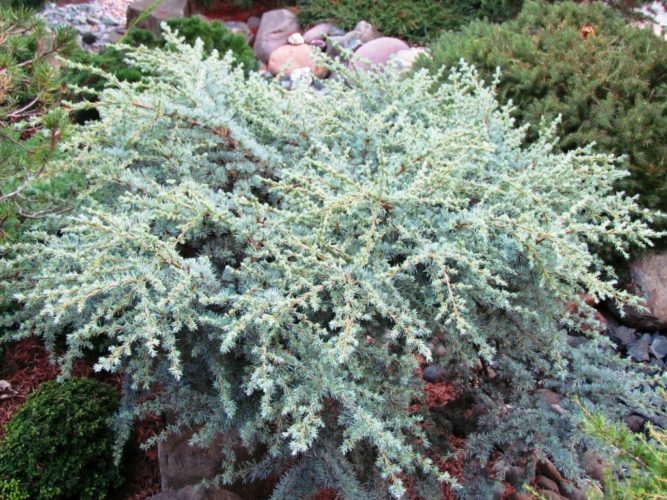 Cedrus atlantica 'Sapphire Nymph' is a prostrate, bright Blue dwarf selection of Atlas cedar. Needles are about half the length of those seen in the species. Internodes between brachlets tend to be weak which not only gives the plant its flattened growth pattern, but also makes it a delicate plant. After 10 years of growth, a mature specimen will measure 10 inches (25 cm) tall by 30 inches 75 cm) wide, an annual growth rate of 1 to 3 inches (2.5 - 7.5 cm). Talon Buchholz says in his Flora Wonder blog, "The needles are silvery-Blue but the new growth is creamy-white. It glitters, like I guess a sapphire should." Pat McCracken and his namesake nursery in Zebulon, North Carolina is credited with the origin and introduction of this cultivar in the late 1990s. McCracken propagated it from cuttings taken from a witch's broom found at the nursery. Cedrus atlantica 'Sapphire Nymph' — at Jody Karlin's Vista Garden, Conyers, Georgia.